Druid's had a five mana 7/7 WAAAY before 4 mana 7/7s came into fashion! Also any of the Choose One Druids are beasts upon transformation. By itself, this card is UP by the vanilla test, however if you have a Beast, the card becomes a 7/7. If you have a Beast, the card becomes a very good value, worth 7 mana but only requiring 5. The sheep from Polymorph and the frog from Hex are Beasts. Hence sometimes the 7/7 can be a decent comeback. This card is like a 5-drop giants for Druid, although it's hard for a construct Druid deck to have enough beasts. 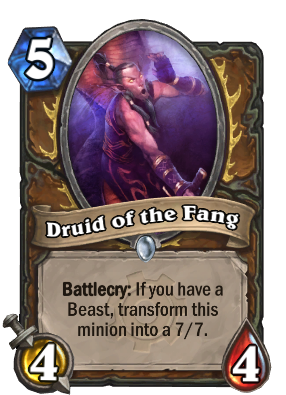 One major downside is that Beast cards in this game usually have high attack and low health, so they can't live long enough for playing Druid of the Fang. First impressions - very positive. 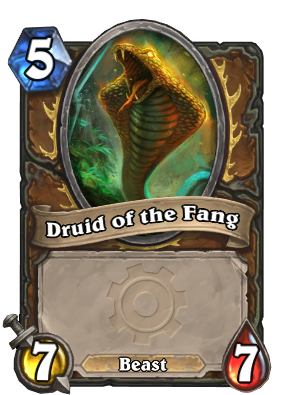 Also as someone mentioned, after the first snake (which is a beast) you cant pump out other snakes for 5 mana. I think Jungle Panther might be interesting with this card. Being stealth, it can more easily combo with Druid of the Fang. It can also combo well with savage roar, and can trade favourably in many situations. Man this guy was unexpectedly good in arena. The transformation is a beast itself so once you get one out it is easy to just continue pumping out 7/7s for 5 mana. Transformation looks awesome and has funny Indiana Jones quote when summoned. Willing to try this card in constructed now. What beasts are there for druid? This card seems a bit specific and although it is good and can't be silenced, can almost never get activated. It would mean running cards like bloodfen raptor, specifically for this card. Druids only have one class beast, but there are other playable beasts, like Haunted Creeper, Dire Wolf Alpha, Ironbeak Owl, Oasis Snapjaw (if you plan to play some of druids buff spells), Stampeding Kodo, Jungle Panther, and Stranglethorn Tiger. Again, that includes the Panther half of Power of the Wild, and maybe we'll get some other cool non-deathrattle options to give it some play, maybe even another Druid class beast. Makes Young Dragonhawk viable, pay 6 mana and gain a 7/7 beast with windfury and a 4/4. I guess it is ok.